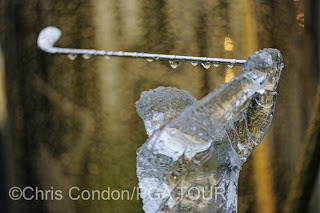 The Charles Schwab Cup Championship in Sonoma is usually one of the highlights of my season. I get to visit my brother in Berkeley and spend a week in wine country. This year was an exception. Beth was unable to make the trip, and it turns out that she was lucky she didn't. It rained cats & dogs from Thurs-Sunday. It was pretty miserable... Nothing stayed dry and we got completely rained out on Sat. We were lucky to finish on Sunday! 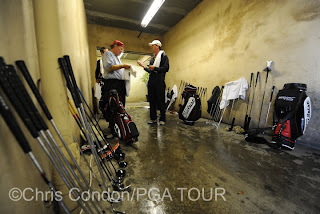 Caddies dry out clubs and bags in the cart barn. 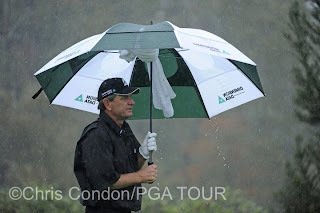 Nick Price walks off the second tee in a downpour. 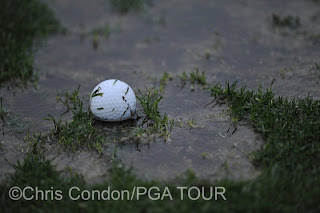 Even the tournament trophy was barely above water!